Inspirational karst landscapes, tropical beaches, city streets humming with scooters and river deltas – where lives are spent on the water. 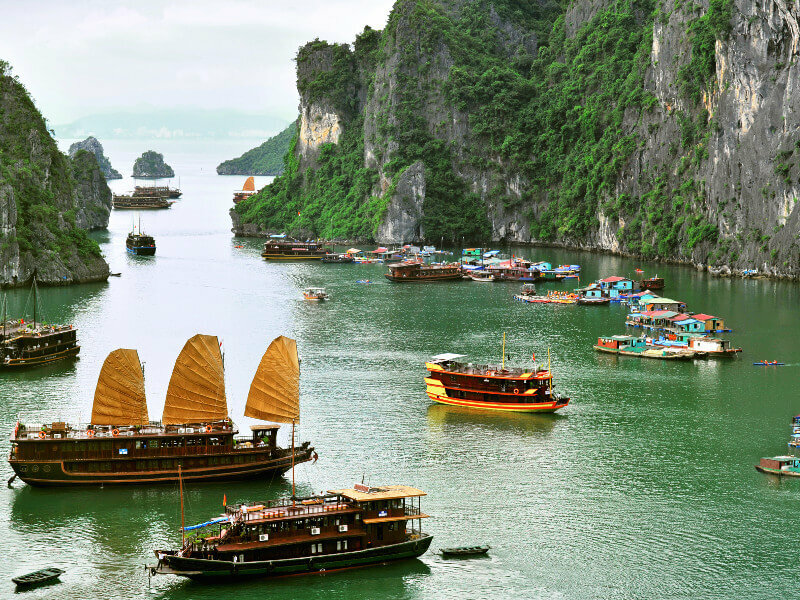 This is Vietnam, and we’ll take a whistle-stop trip through its best places. Hanoi and Ho Chi Minh City are the big metropolises, where new tower blocks crop up by the year. The streets in the old centres still throng with scooters, and there’s an on-the-go dining culture that inspired the street food craze in the west. Both cities have French colonial quarters with fin de siècle elegance. And you can detect that same French flavour in Sapa and Danang, temperate hill stations for Westerners who had to get away from the heat. Standing like monoliths in the turquoise sea of Ha Long Bay are up to 2,000 karst outcrops. All have pretty steep walls, but no two are the same; some are vertical pillars, others have overhangs and some harbour beautiful little beaches. With dense vegetation growing on every horizontal surface, the place offers a vivid green landscape against the silvery stone. Being karst, many of these islands have caves: Sung Sot and Dau Go are just two that demand a visit, both teeming with supernatural concretions. There are many ways to negotiate the bay, on a manned rowboat, from the deck of a junk or on a luxury cruise. You can also take things into your own hands and discover this spellbinding UNESCO site by kayak. Beside the Red River is the city that has been Vietnam’s capital on and off for 1,000 years. In the Old Quarter, the streets are named for historic guilds, and the businesses on each street still ply the same trades as they did hundreds of years before. With markets, legions of vendors and an endless stream of carts and scooters, there are a thousand things happening at once. Streets here have “tube houses”, slender makeshift buildings that rise up and up to exploit the limited floor space. The French Quarter is where the mayhem of the Old Quarter ends. It’s home to wide boulevards traced by villas for ambassadors and government officials, with a Beaux-Arts opera house and cafes adorned with Belle Époque awnings. 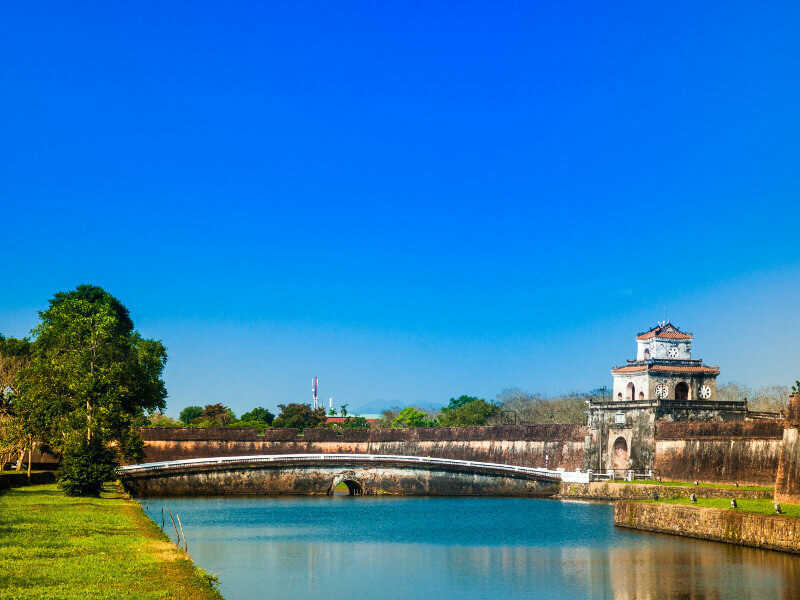 As the seat of the emperors of the Nguyen Dynasty, Hue was capital for a time between the early 1800s and 1945. The legacy houses spectacular mausoleums and an enchanting imperial city contained by a citadel. This is a stirring complex of pavilions, museums, shops and temples, hemmed by walls and a moat that surrounds the whole compound. Outside, on hills by the Perfume River are the tombs of the emperors who ruled from Hue. Emperor Minh Mang who died in 1841 rests forever in his luxurious palace retreat, amid water gardens and a courtyard guarded by a small stone army. Formerly Saigon, this city needed some time to recover from the war. But it is now becoming an economic powerhouse, as the skyline shows. The Bitexco Financial Tower is the city’s modern symbol, and has the Saigon Skydeck for complete views of the city. 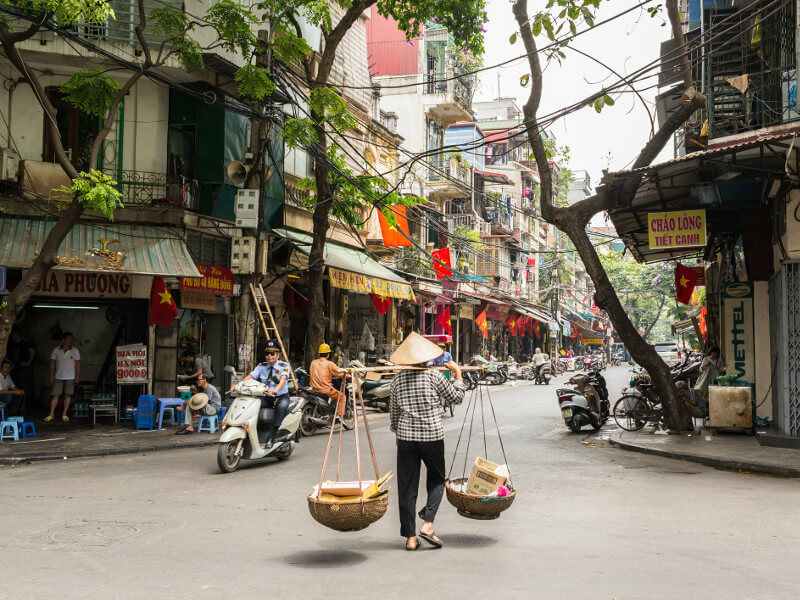 Ho Chi Minh City is fast-moving and frantic, and the fragrance of street food stalls is intoxicating. Food tours on the back of scooters bring you to neighbourhoods you might not otherwise see, like District 3 or 5, where the food is cheap but delicious (think banh mi sandwiches and skewers galore). If you’re an adventurous eater, don’t miss these strange delicacies in Vietnam. For history lovers, the 60s and 70s aren’t forgotten. The War Remnants Museum is an unflinching journey through the conflict, and the Cu Chi Tunnels dug by the Viet Cong have been made public. 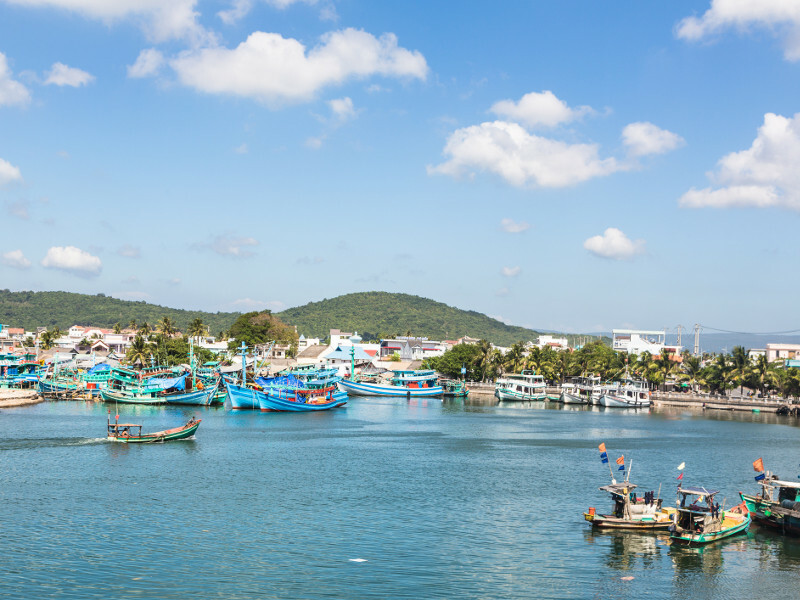 Between the 1400s and 1800s, Hoi An was Vietnam’s main port and is much the same today. 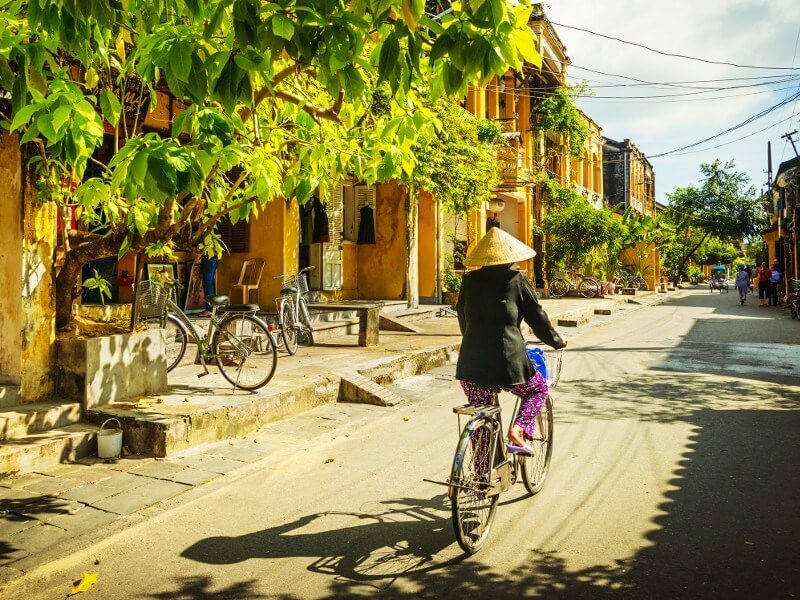 As a quintessential Southeast Asian trading post, Hoi An is a World Heritage Site, with hundreds of buildings safeguarded as historic landmarks. Many of these were built by foreign hands, arriving via the port from Europe, China or Japan. The Ancient Town needs to be done on foot, adventuring along streets with centuries-old temples, houses and workshops where ancestral handicraft techniques are still going strong. 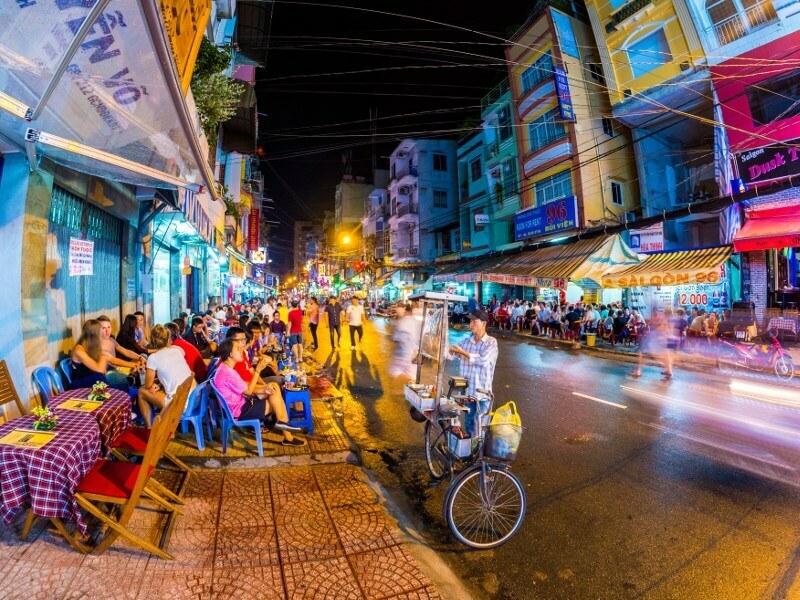 And see if you can be in Hoi An at full moon, when the city’s weathered facades are lit by lanterns and there’s a procession through the streets. On the northern cusp of the Hoang Liên Sơn range, Sapa is a glorious mountain town loved as a foothold for hikers and climbers. Given the cooler climate at this elevation, Sapa became a French hill station in the 19th century when it was linked to Hanoi by rail. There are shades of that French influence in the church and stately colonial houses. On market days different ethnic minorities from outlying villages come down in multicoloured traditional dress to tout their wares. You can also visit some of these villages on treks with the help of local guides, passing waterfalls as you go. 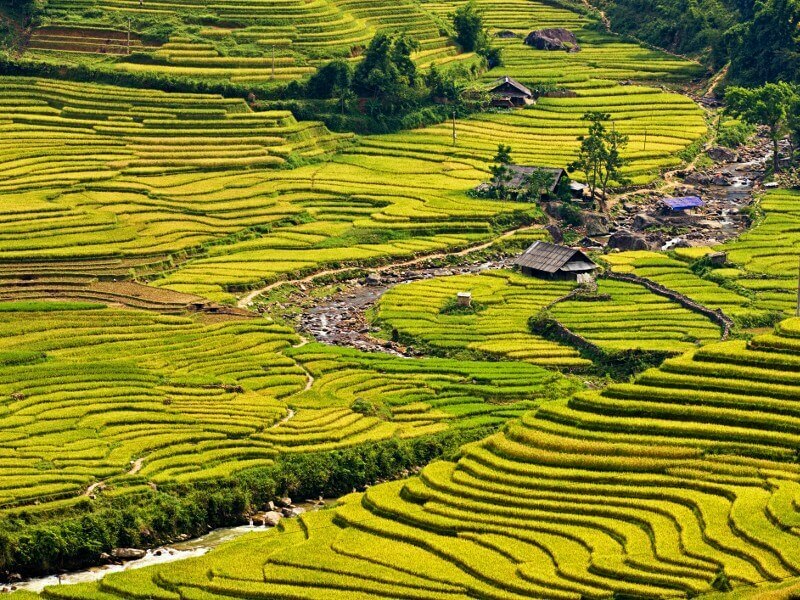 Try to get to Sapa around October during the rice harvest when the terraced hillsides are at their greenest. On the way to the South China Sea, the Mekong River splits into two branches and then again into nine estuaries across three Vietnamese provinces. Water dictates the way of life in this fertile region of mangroves, rice fields, fruit plantations on islands, vegetable patches, fish farms and fields of sugar cane. Just to illustrate, more than half of all the rice grown in Vietnam comes from the Mekong Delta. 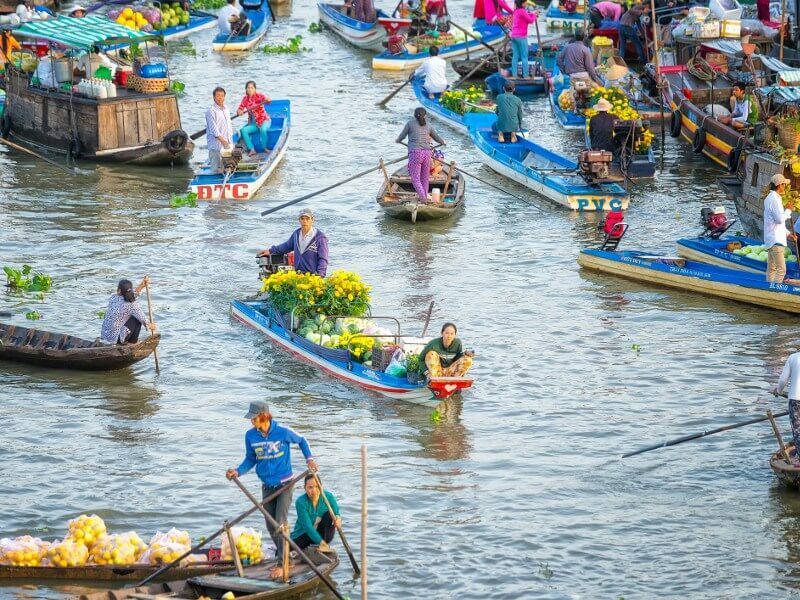 You can get around by boat, watching water buffaloes ploughing the fields while you buy fruit like mango or rambutan at a floating market. Check with the operators in the region for a range of tours, taking you to rice paper and noodle-making workshops or the old swamp hideouts of the Viet Cong. Learn more about the river and discover the culture, landscapes and lifestyles along the Mekong flow. 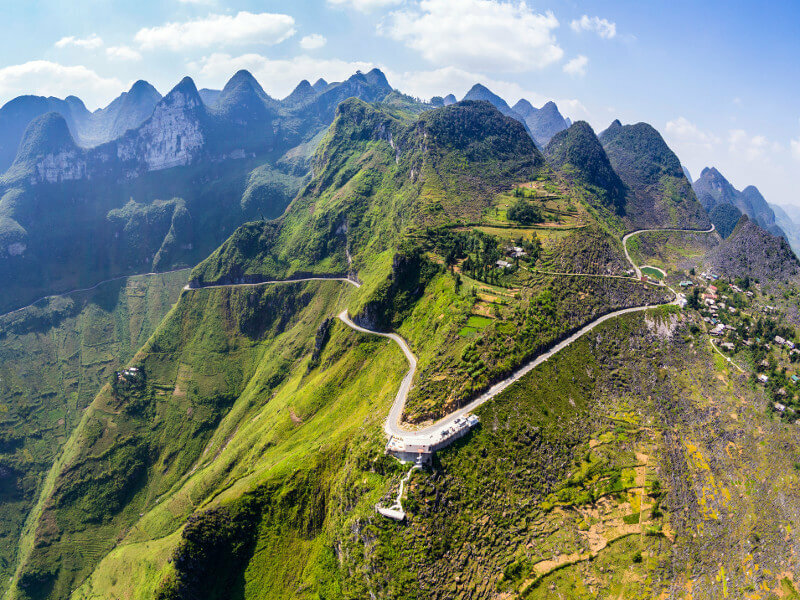 If you’re in Vietnam to venture where few tourists go, the northern Ha Giang Province is as distant as it gets. Ha Giang is in a region of dreamlike karst formations, hospitable villages and mountains terraced with bright green rice paddies. The only way to tackle this country is by bike, either hiring your own or travelling with a guide. You’ll ride circuitous upland roads that bring you to places like the heavenly Ma Pi Leng Pass. This “National Landscape” was made accessible in the 60s by a hair-raising 20-kilometre road cut from the green mountainside. The implausibly beautiful Ninh Binh Province is in the Red River Delta, and woven with places where history and natural splendour collide. The landscape is scattered with formations that mount abruptly from the plains and often have pagodas and lookouts at the top of monumental stairways. Breathtaking Tam Coc Bich Dong is a UNESCO-listed landscape and has a flooded cave amid paddies that you can navigate by kayak. Also here is a 15th-century complex, with three pagodas posted high on the karst rocks. Yet another place you can’t pass on is Bai Dinh Temple, Vietnam’s largest Buddhist temple complex. 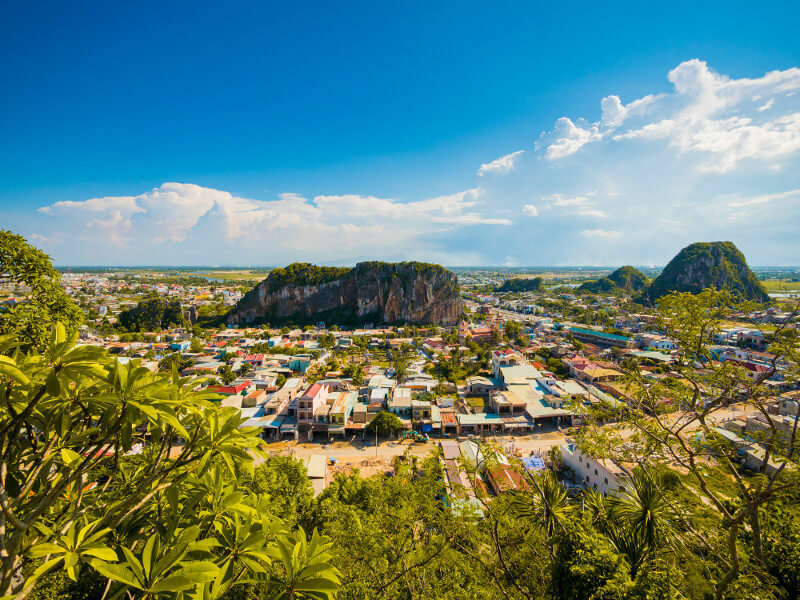 When French colonists in the south of Vietnam needed to beat the summer heat, they fled to temperate Danang, a hill station in the South Central Highlands on the shores of the Xuan Huong Lake. On the back of its discovery in 1897, a town of elegant villas sprouted amid the pine forest. Pair those with typical pagodas and you have an Alpine resort with a Vietnamese twist, unaffected by the war. Now it’s the go-to place for besotted Vietnamese couples to tie the knot, and they’ll be seen visiting Dalat’s beauty spots arm in arm. The town is also a springboard for hikes amid tea fields, coffee plantations and orchards, or visits to far flung villages with their own ethnic minorities. Make a note to see the Art Deco palace of Bao Dại, the last Vietnamese emperor, forced into exile in 1955. As Vietnam’s prime beach resort, Nha Trang is all about unashamed indulgence. There’s a continuous sweep of golden sand, arcing in front of modern sky-scraping tower blocks and over to the greenery of Hon Tre, in an archipelago of islands. Fish and seafood are front and centre on the menu: Think tantalising spreads of fresh crab, lobster and shrimp. And the mix of warm water temperatures and outlandish marine life should put diving in your plans, even if you’re a newbie. Then when the sun goes down, Nha Trang’s holidaymakers dress to impress and hit the beachfront strip where the parties thump until the early hours. 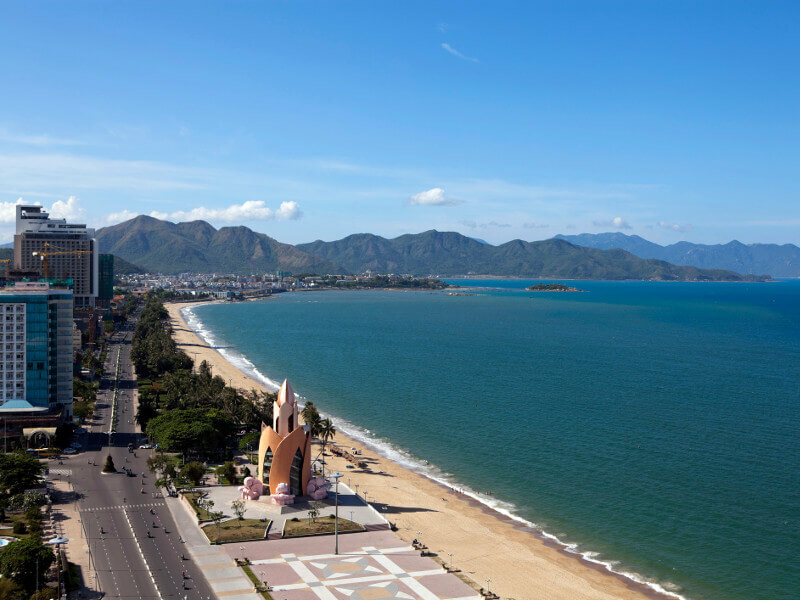 Vietnam’s largest island is night and day compared to Nha Trang, but just as alluring. Phu Quoc is a more discreet beach getaway, with a tropical shoreline and forested hills reserved as a national park. There are lots of tour companies ready to whisk you into this backcountry to see pepper farms and factories processing anchovies to make Vietnam’s notoriously robust fish sauce, Nuoc Cham. The palm-fringed beaches to mark on your map are Sao, Bai Truong and Bai Khem, with sugar white sand and circular basket boats pulled ashore by fishermen. In the North Central Coast region is the second largest karst system on the planet, in the boundaries of a national park established in 2010. 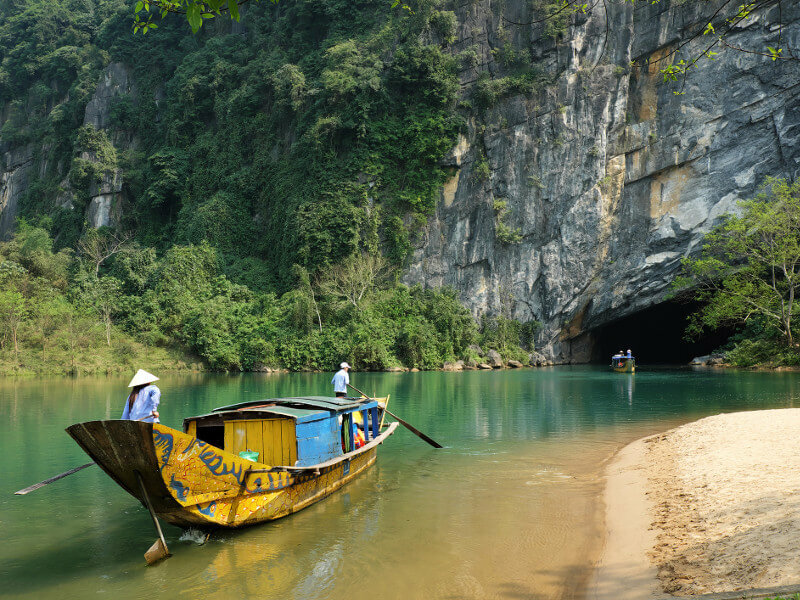 It’s another World Heritage Site and contains the mighty Phong Nha Cave, officially the largest cave in the world with more than 44 kilometres of tunnels. You’re allowed to see the first kilometre or so, which is more than enough to gauge the scale of this landform. It’s one of a handful of gargantuan caves open to the public, like the Han Son Doog, which has a chamber big enough to fit a New York block inside, including a skyscraper. Four hours east of Ho Chi Minh City is this quiet seaside town growing as a weekend retreat for city-dwellers. 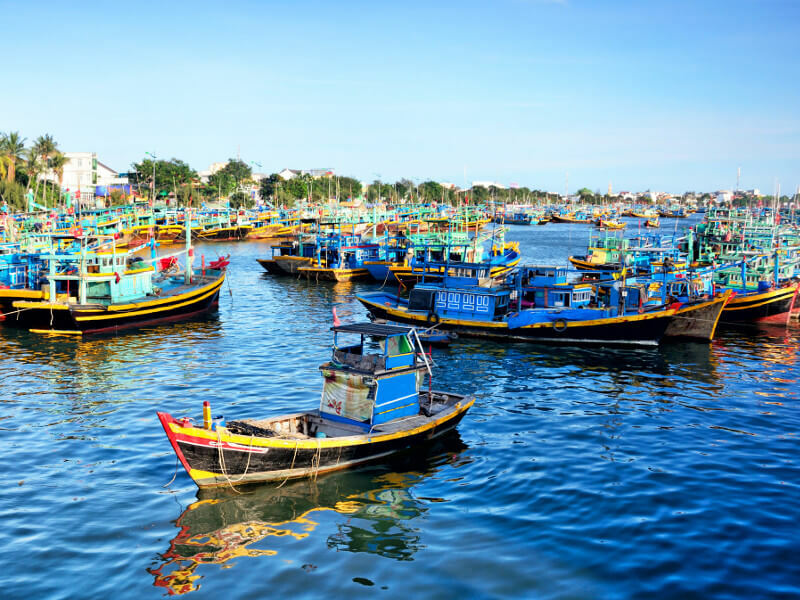 In Phan Thiet you can see the fishing community at work or browse the market. Around the headland is Mui Ne, which has its own energetic fishing harbour and a wondrous beach. Mui Ne’s winds attract a high class of international kitesurfers and sailors, but if you’re just here to bathe, the water is shallow and warm. There are loads of options for detours, on a quad bike adventure to the Sahara-like White Sand Dunes, the ochre Red Dunes or to see Cham Empire Towers dating back hundreds of years. In the Central Coast region lies one of Southeast Asia’s most fabled Hindu temple complexes. 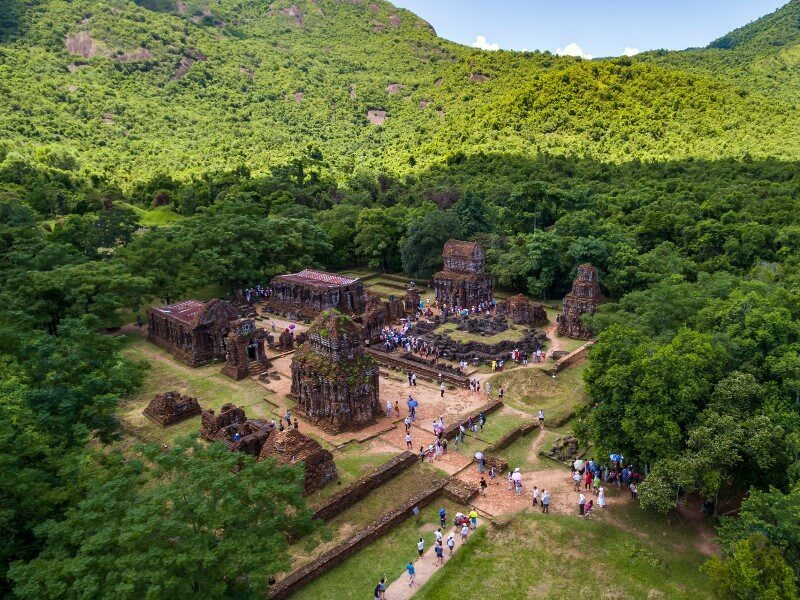 This site was inhabited for about 1,000 years between the 300s and 1300s, and despite taking damage in the Vietnam War can still astonish with its size and sense of majesty. These structures were built with red brick, which was then carved with sophisticated patterns and statues. My Son was a burial place for emperors and the site of religious rites, and at its prime, had more than 70 temples. The easiest way to get here is on an organised tour from Hoi An or Danang. If you’re new to the Champa Empire, there’s a museum at the entrance to the park, with artefacts and a chronology of the empire. 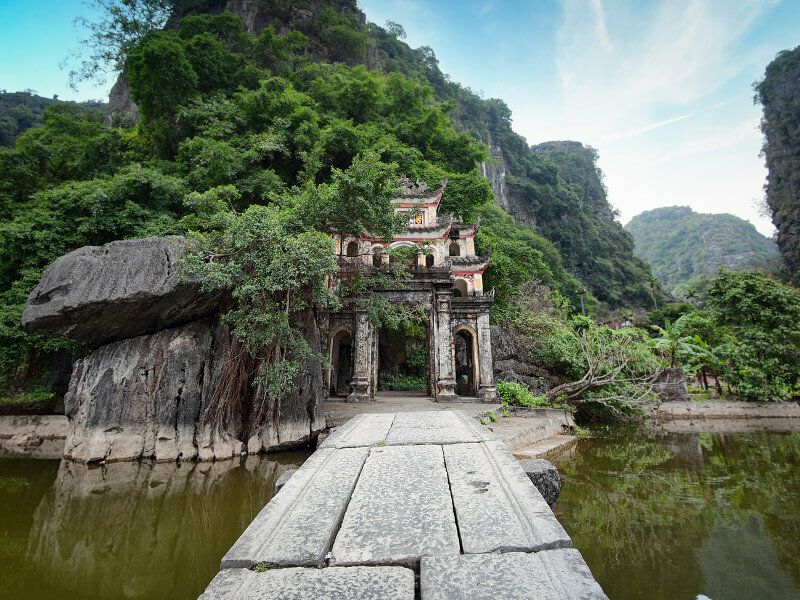 If you’re a first-timer, Vietnam will definitely enthral you with its beauty and spirit. But, before you travel, learn about the local culture and update your vaccinations. Don’t forget to carry travel insurance and learn about any local travel advisories as you finalize your trip itinerary. Have any questions or recommendations about the best places to see in Vietnam? Share them in the comments below.